Theresa & Abraham Clapman had four children who loved to create art. As adults, all continued to enjoy their artistic roots. 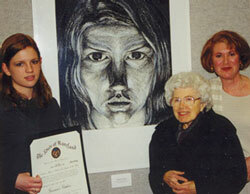 Two developed careers as art educators and professional artists. As parents, Terri and Abe learned the importance of nurturing young talent. The Clapman Fund began in 1998, under the stewardship of the Maryland Artists Equity Foundation (MAEF). MAEF is a nonprofit organization that awards scholarships to gifted high school senior art students to encourage them to pursue advanced education and seek careers in the visual arts. An annual scholarship competition was held from 1984 to 2008, picking twenty-five finalists from over 100 applicants each year. Since MAEF has merged with Maryland Institute College of Art (MICA), their scholarships are based on need and merit, and are juried and awarded by a committee of MICA faculty and staff. Scholarships continue to go to Maryland’s most promising young artists, who choose to stay in Maryland and attend MICA. If you are interested in supporting the Clapman Fund’s 2012 young-artist scholarship, at MICA, please contact Nannette or visit www.mica.edu/give. 1998: The first Clapman Scholarship was awarded to Cindy Jones; presented by Theresa Clapman in memory of her husband, Abraham; Nannette looks on.